I am excited about the New Year and what we have in store for our club. We have a really good Board of Directors that is planning speakers, educational events and outings that will add to your fly fishing knowledge. Speaking of the Board of Directors, I would like to thank those individuals that have come forward to fill expired terms of outgoing Directors. These people are: Secretary, Joy Summers; Membership Director, Donna O’Toole; Speaker Director, Glenn Guminski; Outings Director, Chris Patnode; Fly Tying Director, Carlos Crespo; Education Director, Vincent Turley; Auction Director Kevin Marlow; and Legal Advisor, Mike Nelson. They are already generating some great programs for this year and bringing with them fresh ideas and excitement. Please get to know these folks and let them know that they can count on you for your support and your wiliness to help. Our 2019 Calendar is shown in this newsletter and has some events that you might want to get on your personal calendar. In February we have Landon Mayer coming to speak at our Feb. 5 club meeting. Landon will also be at Backwoods Feb. 3, the Sunday prior to our meeting, for a fly-tying demonstration of flies he uses on his guide trips. The following Saturday morning, Feb. 9, Fishy Fullum, noted author, artist and fly tyer, will host a Fly-Tying seminar. This will be held in the same place as where we hold the club meetings in the classroom at the UNT Health and Science. You can sign up for both of these events on our website, fortworthflyfishers.org. The club’s outing for Feb. 22-24 is to Broken Bow Okla., fishing the Lower Mountain Fork that winds through Beavers Bend State Park. This is always a popular outing and we have enhanced the weekend by providing on-the-stream seminars that are presented by guides from Beavers Bend Fly Shop. Club member Greg Kohn will be hosting this outing. Please see the article in this newsletter for details. 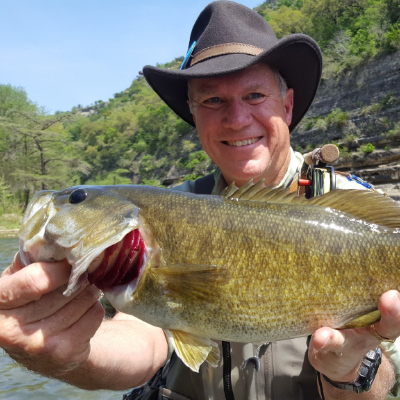 Two other events you will want to note are Fly Fish Texas in Athens on Feb. 16 and TRWD Flyfest 2019 on March 9, held on the banks of the Trinity River right in our own backyard in Fort Worth. Fort Worth Fly Fishers supports both of these events with resources and volunteers. These festivals are just a whole lot of fun and are very educational. We need volunteers and you can earn VIP hours. If you would like to get involved, please contact any of the Board of Directors. Lastly, and don’t forget, APRIL 6 is the date for FWF4 at Wild Acres Brewery. This is our annual fundraiser. Revenues from this event allow us to run the club’s business, have speakers, educational seminars, outings and support the charities that we sponsor through our club. It is really a lot of fun and you can get some great deals on fishing gear, guide trips and even things for the house.